The measures_displacement function predicts the horizontal location of a parcel of ice after a specified amount of time, based on InSAR surface velocities. This function does not account for the vertical structure of ice velocity. 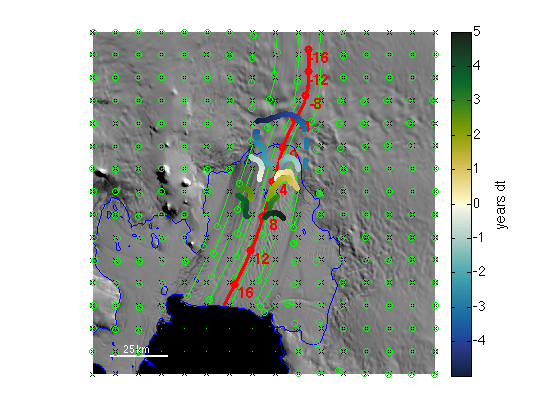 This function requires the MEaSUREs InSAR-Based Antarctica Ice Velocity Map, Version 2 netcdf dataset which can be downloaded here: https://nsidc.org/data/NSIDC-0484. [lat_end,lon_end] = measures_displacement(lat_start,lon_start,dt) gives the geographic locations of points given by lat_start,lon_start after dt years. The dt variable can be negative if you'd like to estimate where a parcel of ice was dt years ago. [x_end,y_end] = measures_displacement(x_start,y_start,dt) performs the same function described above, but returns values in polar stereographic meters if input coordinates are polar stereographic meters. Coordinates are automatically determined by the islatlon function. Consider this 10 km resolution grid, 150 km wide, centered on Pine Island Glacier. For context let's add a low-contrast MODIS MOA image with modismoaps and Mouginot et al's grounding line and coastline with antbounds. 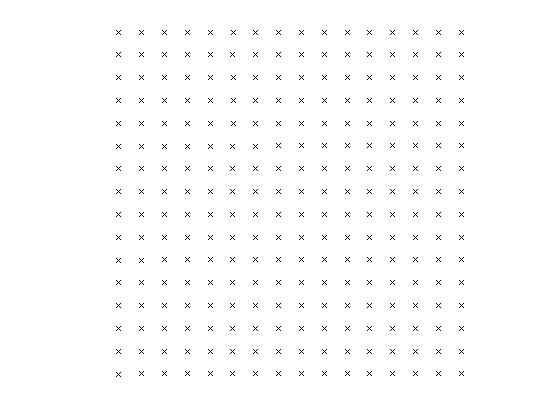 Where will each of those black x marks be in five years? It may be important to note, although I've just linked starting points with ending points using by single line segments, the measures_displacement function actually solves for each year, so in the underlying math, there's actually five line segments connecting each starting point to each ending point. The difference may be significant in fast-flowing regions with curving flow or over long periods of time. t = -16:4:16; % every four years from 16 yr ago to 16 yr from now. Above, you can see the ice stretching out as it speeds up. You can also see that this function does not compute straight-line paths based purely on the velocity at the initial position. If neither the starting locations nor dt are scalars, measures_displacement will assume you want the displacement of many points, each with their own distinct dt value. This might be for laser altimetry collected over multiple years, each data point collected at a different time. Here's a case that doesn't make much sense physically, but is a convenient example because you already have the data. I'm using the grounding line data and saying, let's look at the location of each point advected some amount between minus five and plus five years. I'll use the cmocean function for a balanced colormap (Thyng et al. 2016). VELOCITY DATA: Rignot, E., J. Mouginot, and B. Scheuchl. 2017. 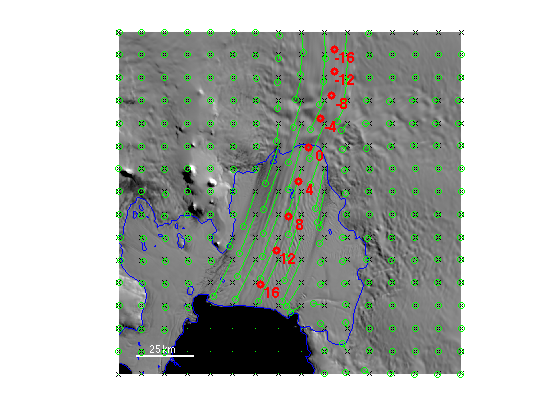 MEaSUREs InSAR-Based Antarctica Ice Velocity Map, Version 2. [Indicate subset used]. Boulder, Colorado USA. NASA National Snow and Ice Data Center Distributed Active Archive Center. doi: http://dx.doi.org/10.5067/D7GK8F5J8M8R. A LITERARY REFERENCE FOR THE VELOCITY DATA: Rignot, E., J. Mouginot, and B. Scheuchl. 2011.Ice Flow of the Antarctic Ice Sheet, Science, Vol. 333(6048): 1427-1430. doi:10.1126/science.1208336. This function and supporting documentation were written by Chad A. Greene of the University of Texas Institute for Geophysics (UTIG), December 2016.